Jason Voorhees (Friday the 13th) 350 HP 250 Hunger (burns slow) 50 Sanity -Hits hard. Really hard. -Has his iconic machete, it can also cut down trees. -Low sanity but isn't fazed too easily. -Custom sound. -Slow. Legal gubbins: Jason Voorhees and Friday the 13th were created by Victor Miller, and owned by New Line Cinema (I think). Don't Starve and related characters and concepts belong to Klei Entertainment. The Sharp Claw Pokemon, Weavile, joins the Brawl! (Or Don't Starve) Weavile is balanced to be like how he is in the games, a glass cannon, he can deal a lot of damage and move very fast but can't take many hits at all. Being a dark pokemon, he suffers less sanity loss from monsters and the darkness and being ice type he is immune to cold but takes extra burning damage. Weavile has: 70 HP 75 Hunger 170 Sanity -Hits 3 times harder than average. -Moves twice as fast as Wilson. -Is immune to cold and freezing. -Loses less sanity to night and monsters. -Custom voice (filtered Wallace talk sfx). --- Known bugs: --- -Weavile can get kind of stuck trying to reach a point/put something down and go to and fro very fast, make him move somewhere else to fix this. --- Art courtesy of CatOfDoom http://catofdoom.deviantart.com/ Inspiration and dialouge by Xander3000 http://xander3000.deviantart.com/ --- I don't claim Weavile or Pokemon as my own, they belong to Nintendo/Gamefreak, this is just a non-profit fanwork. Seems fine to me and you can play mods if they're out of date anyway. 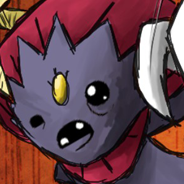 DEH I FEEL NO SMAERT NAH MOA Weavile had the DAY off as complaints about being OP has stressed him out, this is all we could find at such short notice... and now he won't go home. He did however, get into our medicine cabinet and ate some more pills; this has made him less utterly useless. Nerphile has: 40 HP 50 Hunger 60 Sanity -Hits 70% of average -Moves twice as fast as runny bread (75%) -Immune to noogies but not cold -Loses sanity to anything ooky or that he doesn't understand (may include trees and certain birds) -Custom voice (and music) --- Known bugs: --- -Is known to be a bit too OP -Music overlaps other characters and itself --- Known phobias: --- Trees Pinecorns Grass Kabobs Rocks Those plastic things on the end of your shoelaces, terrified of those. That, somewhere in the world, a deer is drinking from a stream. And looks up. At him. This is me, WARIO himself, I always write my own manuals for my amazing games so I'm writing this as well! Look at my stats and wish you were me! : 280 HP - I can take a beating! Give me your best shot! 450 Hunger - I can eat and eat and still look amazing! I get hungry really easily though. 110 Sanity - Who needs sanity when you got muscles like me! -I'm THREE times stronger than that Wilson guy! -I ain't afraid of no ghosts but the dark gets to me a bit... -I got it all! Custom voice and music baby! I only talk my words so no reading for you bookworms! -My many layers of clothes (honest I'm not fat) keep me warm against the winter chills. -I come with my own hat as well! Stylish huh? Known bugs: -Battle music doesn't stop on death and doesn't fade in/out, it's too good! -My custom music plays when playing as other characters, just as it should be, who needs that when you've got my melodies? --- Legal gubbins: Custom audio, sound and my amazing likeness belong to Nintendo! Don't Starve and related characters and concepts belong to Klei Entertainment. Maker of the mod "Wren the Stormcaller" that was used as a base to learn: Sukoushi (http://forums.kleientertainment.com/index.php?/topic/27502-character-wren-the-stormcaller/) Written by: Wario Wario esq. Very nice, been playing DST as well, still have never made it through my first winter alone or with a friend to freeze with but I'll keep trying U: Really glad you guys have gotten such good feedback and success, certainly well deserved! Phillip from Space Funeral. Phillip has: 200 HP 210 Hunger (depletes slightly faster than normal) 80 Sanity -Hits slightly harder than average. -Loses sanity easily. -Custom sounds, lines and music. -Is slightly insulated. (20 inherent insulation PJs) Be sure to examine things, there might be some references to Space Funeral... But it is too late for you. If it's not too late for you then you can always throw in suggestions for unfilled dialogue lines. --- Known bugs: -Battle music doesn't stop on death and doesn't fade in/out. -Would be great to have his own map icon but I've never seen it done. -Maxwell intro speech not changed, I'm not sure how to do it for this version of Don't Starve, if anyone knows, by all means tell me and I'll change what he says at the start of the game. -If Phillips custom music plays when playing as other characters, please disable his mod for the time being. --- Extra info etc in readme file included, but it's too late for you! Hmm, I'm trying to use this but it always fails and says my file is too big: It's a character mod with one music track replacement and is 11.5MB. Is there a way around this or should I lower quality on the track? EDIT: I turned down the quality of custom SFX and music, all of them together come to 482kb, but the FSB file is 10MB by itself for some reason, it hasn't got any other sounds in it's bank than the ones I'm using.